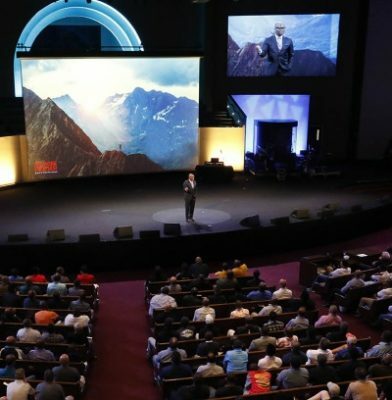 Founded in 1976 by pastor and author Dr. Tony Evans with just ten members in his living room, Oak Cliff Bible Fellowship in Dallas, Texas has grown into a mission-driven mega-church of nearly 10,000 members. Its sanctuary seats approximately 3,284 people in a semi-circle with generous balconies and great sight-lines. However, OCBF’s existing audio, video, lighting, and acoustics were outdated and failing. The church called on AVL integration firm Clair Solutions, which met with church officials to determine the best path forward to meet their current and future needs. After designing a system, the installation team at Clair Solutions turned plans into reality between Christmas and Easter. The crew worked through the week and then turned the sanctuary back over to the church on Friday so they could hold their regular weekend services without interruption. Part of OCBF’s vision involved bigger musical impact, and the engineers at Clair Solutions called on sister-company Clair Brothers for a beefy line array comprised of C15 loudspeakers for mains and kiTCurves for sides to energize the sanctuary, with low-end support from eight Clair Brothers CS218 subwoofers. The subwoofers form a cardioid array that pushes more low-end energy to the seats and less to the stage. Lab.gruppen D-Series multi-channel amplifiers with integrated Lake DSP power the system, with additional processing from stand-alone Lake LM44 DSPs. Studer digital consoles at FOH, monitors, and broadcast (with full Pro Tools recording and playback capabilities) provide user control for OCBF’s technically-savvy staff. Antelope digital clocks keep the entire system in reliable sync. Roland personal mixers and Shure wireless microphone systems deliver big improvements on stage. Clair Solutions’ acoustical engineer, Justin Graybill, flew to Dallas to take measurements on the sanctuary’s sheetrock acoustics and then modeled it back at the company’s Pennsylvania headquarters. Per his design, the installation team put in full acoustic treatments for the side walls and the back wall to help with reverberation and to minimize low-end buildup under the balcony. “The goal was not to completely deaden the space,” Mason says. “The 150-person choir is (and will continue to be) a big part of the service.” Instead, Graybill specified two-foot square diffusion panels for the side walls and broadband absorption for the back wall. Thus, the acoustics are controlled and strike a lovely balance between too energized (bad for intelligibility and amplified music) and dead (bad for the choir). On top of addressing issues in the main sanctuary, Clair Solutions also designed and installed a complete AVL system for OCBF’s on-campus conference center. The conference center can function as one large 70 by 120-foot ballroom or can subdivide via air walls into three separate spaces. Crestron digital media inputs and outputs allow any source to connect with any destination. Clair designed the conference center system so that it could receive or send audio and video signals to the main sanctuary, allowing for overflow or sophisticated parallel events. A smaller Clair Brothers kiTCurve line array with Lab.gruppen amplification and processing make the conference center concert-ready. “It’s really great to partner with a company like Clair Solutions,” says Walter Silverberg, media director at OCBF. “Every single person we ever interacted with from Clair Solutions was professional, experienced, and very knowledgeable. “I love working with Mike [Mason]; he’s deep inside our issues and really understands what we’re about. He’s taught me a lot. For example, our audio and video systems make extensive use of the in-house Ethernet network, and we recently had some inexplicable issues pop up. Mike correctly diagnosed the problem to a change that our IT department had recently made, and he helped out at a meeting between the media department and the IT department to resolve the issue.